The Scoop: More than just a landmark and memorable date spot, Mel’s Drive-In is a classic American icon from the movies. Dating back to the 1940s, this family-run collection of diners in California takes patrons back to the days of leather jackets and slicked-back pompadours. One of the only things Mel’s Drive-In has updated since the “American Graffiti” days is its menu, which offers modern twists on classic diner fare. Couples can share a milkshake and order up old-fashioned favorites and new tastes beloved by vegetarians and Instagrammers alike — no reservation required. In the early 1940s, Mel Weiss decided to take a vacation and drive from his home in San Francisco down to Los Angeles. In L.A., he noticed cool, fun restaurants where people ordered food from their cars in the parking lot. A waitress — sometimes on roller skates — would bring out the food, and diners would eat in the comfort of their vehicles. The original Mel’s Drive-In had plenty of charm and room for 110 cars. If you’ve ever seen the movie “American Graffiti,” which was the first film for George Lucas, the creator of “Star Wars,” you may already be familiar with the diner as Mel’s was the backdrop. Mel Weiss founded Mel’s Drive-In in the late 1940s, and it has grown to become a date-night staple. Today, a mix of retro architecture, tasty food, and cool kitsch make Mel’s Drive-In one of the hottest spots for a no-hassle, fun date night in California. The restaurant’s Instagram feed is filled with celebrities, but it’s just as likely that you’ll sit next to a couple who has been coming back to Mel’s for years. While Mel’s Drive-In is a 1950s-style diner, it has updated its menu to include new tastes alongside old-fashioned favorites. That variety means daters will be happy eating at Mel’s no matter what their particular tastes. Classics like meatloaf, fried chicken, and salmon are always popular because, like all the food at Mel’s, they’re served fresh and never frozen. 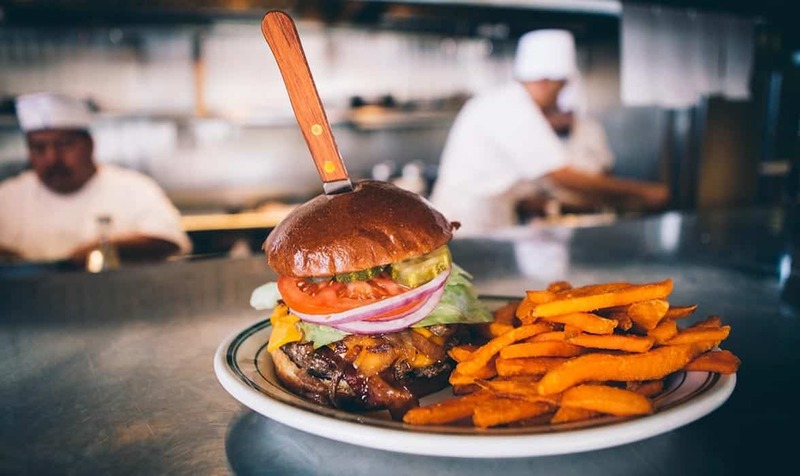 People often order the classic Mel Burger, as well as the Sunset Burger, which is a half-pound of grass-fed beef served with cheddar cheese, crisp bacon, avocado, lettuce, and red onion on a grilled sourdough bun. As times and tastes have shifted, Mel’s has added new menu items that diners crave. Mel’s serves up both classic fare, including the Mel’s burger, and new dishes like the Impossible vegan burger. While staying current with food trends and keeping customers happy, Colton said the goal is still to keep the food as fresh-to-order, organic, and delicious as it was when his grandfather started his first restaurant. Mel’s Drive-In also attracts classic architecture enthusiasts. The Santa Monica location is a prime example of post-modern design known as Googie style — named after the coffee house in Hollywood that inspired it. “That’s classic ’50s architecture like ‘The Jetsons’ and cars with the tail fins. The best example may be the Las Vegas sign,” Colton said. Mel’s Drive-In has three locations with Googie-style architecture. There’s the original on Van Ness, one in L.A. on Sunset Boulevard in Sherman Oaks, and one in Hollywood. The Hollywood location boasts even more history, as it is an art deco style building that once housed Max Factor, a cosmetics company. “It’s where they used to do makeup for celebrities in the 1920s,” Colton said. While some daters envision white tablecloths and fancy bottles of wine on Valentine’s Day, the night can be much more fun and relaxing at Mel’s Diner. Valentine’s Day is one of the busiest days of the year at Mel’s Drive-In, but Colton said there’s never a problem getting a seat. A jukebox at each table is filled with radio hits from the ’50s through the ’80s that daters can play — and even sing along with. It’s certainly a conversation starter and a classic touch that diners seem to appreciate. Mel’s Drive-In is popular on social media, and its Instagram feed is filled with celebrities and mentions. With its retro architecture, interesting atmosphere, and photo-worthy food, Mel’s Diner frequently pops up in Instagram posts and stories. Celebrities, including Paul McCartney, Justin Bieber, Al Pacino, and Leonardo DiCaprio have been spotted eating at Mel’s. The diner has also served basketball star Shaquille O’Neal and rapper Post Malone, who recently gave a waitress a $1,000 tip, Colton said. The diner attracts such a wide range of customers because it’s accommodating and inviting. “We have the full spectrum; from people who drive buses in Santa Monica to CEOs and celebrities,” he said. 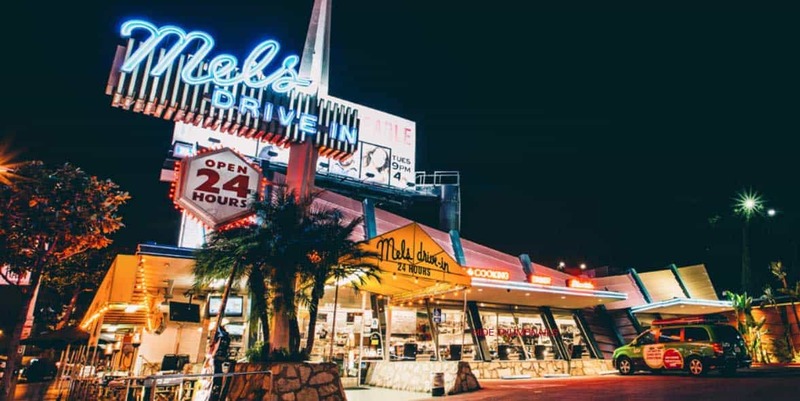 More than 70 years after Mel Weiss was inspired by a trip to Los Angeles to open his own diner, Mel’s Drive-In is still thriving and expanding. Colton said the business is modernizing and branching out with a new restaurant in San Francisco. Called Mel’s Kitchen, the location is a higher-end establishment with a full bar and a wide selection of local craft beers. It’s located on the corner of Geary and Van Ness Avenues, and it’s within walking distance of many of the venues that make for a classic date night. Couples can have a dinner-and-a-show combo by heading over to The Warfield Theatre, The Fillmore, or The Great American Music Hall after their meal. Another location that recently opened is the first Mel’s Drive-In location in Santa Monica. It’s situated at the end of the historic Route 66. The Santa Monica Mel’s Drive-In location is at the exact end of the famous Route 66. Colton added that there’s something special about being a family-run business. He and his team of employees have a lot of fun — just like those who visit the restaurant on a date.